I am switching to tweeting like several others. At first it was tough for me to express myself with a 140 character limit. But I am learning the art of being succinct as opposed to the verbosity here. Easier to tweet about a movie or anything else, sometimes. And I write 3 posts talking of issues and some say my blog is a complaint box or I am being a pessimist. I have become negative. Shucks. I really wonder what makes people pass such sweeping statements of someone based on a simple post talking of an issue. And then there are people who say people who can raise their voices about issues and have the advantage of being heard easily because they are recognized in a crowd simply don't. Proves the age old saying true. You just cant satisfy everyone. But then that has not been my goal. And I am reminding myself again of the proverb that trying to please everyone is a sure way to failure. There are several goals and milestones that I need to achieve. I intend to continue evolving, learning; for the day I stagnate, I shall cease to exist. There were several dozens of people who used to advise my mom from time to time on how exactly to bring me up. And now I sometimes chuckle when I think back and thank God that mom had the wisdom she had for not listening to all the well meaning people. She had been the truly remarkable, magical lady to have made plans that are way ahead of time. She has fulfilled half of them. The other half are just about to be fulfilled. Or rather the plans and goals to achieve keep growing. The so called well meaning society would not have let me be a musician. Why? They used to ask. Study. Become an engineer. Or get a BCom degree. Join a company. Assured income. Settle. Settling - I realize now, is something I have never wanted to do. In retrospect of course. Why settle when one can strive harder and get that something worth spending time and energy for and that which is truly gratifying? Why settle at all? Mom reminds me all the more now.. once you are close to reaching the finish line, its time to set the finish like farther away. There is a lot more that she says to me, but too early to talk about all that. What will be, will be. And I am what I am. U said: Iam now what I am. being lost as one in a million is junk.!! Awesome! you never fail to amaze me. Never let ur spirits down which u never do. Keep going and raise great heights. "The sky is the limit" is an old saying which u would have reached by now. I wish u reach heaven heights. Happen to recognise ur voice in Unnale Unnale movie. Very different it is. It was so nice. All the best for each venture in ur life. Have you sung Vaaroya in Telugu version too? If you feel that you are in comfort zone you growth ends there,so push yourself out of the comfort zone. I am one of those guys who admire you for your good talents but at the same time keep commenting that you are becoming negative. Though you don't need to satisfy me or people like me, we still want to convey our feelings or opinions since we like you so much. There is nothing wrong in highlighting an issue. But if you look at the way you have been doing it is like just complaining. An outburst or whining doesn't solve problems. An educated person like you should think of the underlying causes for any issue and try to address them. Just complaining aggravates people more since there are no solutions. Your approach is applying pimple cream for a cancer. It is easy to complain and whine peripheraly and such acts do not change the situation. When Gandhiji wanted to address the issue of independence, he analyzed the root causes including social injustice and was successful by spelling out a plan for eradicating them. Again as weeds keep growing, bad things emerge again and again. Maintenance and Improvement is a continuous process. There is a fundamental problem of law & Order and corruption in India that needs to be addressed. That is the main reason for most of our miseries. When you talked about the home owner Vs Renter issue, do you think you have resolved atleast one issue? Not at all. There is more of the infectious negative feelings that are spread by writing such things in your blog. You may try to say complaining is my birth right and let some one fight for curing the underlying cause. This kind of argument is expected from ordinary people who do not think beyond the emotions created when they were affected. குழாயடியிலும் ரேஷன் கடையிலும் எரிச்சலை காட்டும் சிந்திக்க தெரியாத சாதாரண குடிமகன், distribution system த்தில் உள்ள குறைபாடுகளை அறியாமல் எப்படி தூற்றுவானோ அது போல் இருக்கிறது உங்களின் வாதம். we need to attack those core issues and come out with workable solutions, otherwise the situation will remain unchanged. உங்களின் இது போன்ற சிந்தனைகளினாலும் எழுத்துக்களினாலும் restlessnessம் negative feelingம் மக்களிடம் அதிகமாவதை தவிர வேறெந்த பயனும் இல்லை. we need radical change in a lot of things. அது பற்றி தீர்வு காணும் ஆரோக்கியமான சிந்தனைகள் மக்களிடம் வளர்வதே ஒரு தேசத்தின் எழுச்சிக்கு வித்தாகும். அது போன்ற positive சிந்தனைகளை உங்களிடம் எதிபார்ப்பது எம் தவறா! True statement Chinmayi - You cannot satisfy everyone.You have been my inspiration.Every blog i read, I see a different facet of you. I truly admire you as a person.You are doing a good job.Way To Go!! Wishing you success in everything you do!! I love these lines in this post..
"Settle I realize now, is something I have never wanted to do. In retrospect of course. Why settle when one can strive harder and get that something worth spending time and energy for and that which is truly gratifying? Why settle at all? Mom reminds me all the more now.. once you are close to reaching the finish line, its time to set the finish like farther away." I find these thougts really constructive.These lines made my day. Thanks for this. Subramaniam: I appreciate your criticism. For eg, My blogging about Stanley Medical College is to make them know that what they are doing is not within their four walls. That day I the other singers who came with me vowed not to go back there again. I am sure I ll let a lot of people know to not go there. And soon they ll not be left with anyone who want to step in that compound. Wishful thinking, but its possible. Because all these random people do what they darned want under the veil of anonymity. And the kind of bullshitting and bossing around they do under the aegis of the college is repulsive. Little do they realize that once they come out of the college they are no different from the next ordinary man. Unless of course, they do something truly extraordinary, or the way some of them are, get involved in a scam. Its a simple report in my perspective. If I am lashing out, then so be it. I am not about to find a 'solution' to the issue at Stanley medical or MCC. The institution does not know how to run a tight ship then the people who are heading it have not earned the respect. And its a Govt college. What do we say? Abolish bribery? Change the management? Tell the government? Even if you and I are going to bring about a workable solution, seriously who is going to be following it? Especially in that college??? Wake up and smell the coffee please. I'd rather utilize that time in practicing, learning, reading or perhaps just looking out of my window into the deep inky sky. Gandhiji addressed several issues which were never resolved. For one, cleanliness. The people are just the way they are. They haven't changed in 50 years. Of course, those who have been abroad and the fear of the law is put into them they are OK there. But they won;t practice that once they step back here. None of Mr Gandhi's plans for a lot of things worked. He spearheaded a collective effort for our Independence. I respect him but wont give him the entire credit for the way the nation is today. Actually the Indians have learnt the art of striking for every thing, disrupting public life at the drop of a hat too. A lot of educationists and respectable people opposed some of his ideas saying that they will be detrimental in the long run. We are seeing it happen now. I will complain. At least I have it in me to do that. We have otherwise grown a skin as thick as a rhino's hide. I am sure enough and more people have addressed this law and order 'problem'. I have on my show on radio. I am being the change I want to see. I don't bribe. I don;t break the rules. Even if I am driving very early in the morning I dont drive on a one way or take a UTurn where its not allowed. When I said so, people won't believe me. What I write is perhaps a drop in the ocean. You could perhaps try telling news channels and newspapers who thrive on sensationalizing the negativities than cover an achievement somewhere. Seriously, who are we kidding? Tenant vs Owner, people are scared to talk about it. With that I got some people to speak up. I am sure, going by the responses on twitter, a lot more people will demand their rights and I got someone to state what the rights of the tenant are. Sure I resolved an issue. Of not taking crap when you dont have to. Especially if its for something you are paying for. For all talk of positivity , sometimes you need to face the harsh truth, and look it in its eye. As for the distribution system and the issues therein, please dont be under the illusion that the common man does not know. He knows the law and system much better than you and I do. And if you have slogged all day, moottai thooki, veettu vaelai senju, road perukki, innoruthan veetu kuppai vaadaiya thaangi, kuppaia alli and your body is going to give in, and you are waiting in a darned queue forever I am sure you will be screaming your wits out too. Everyone will think well and behave well if the basic needs are addressed. You and I living our pretty comfortable lives dont have the right to say that the people at the ration shop dont know how to think. Or rather look at it this way, you work 3 nights in a row with very little sleep, or maybe a little more than that, I ll see how reasonable you would be and how straight you can think after that. I sure I did a lot questioning, asking for solutions, getting expert views in my radio show for two and a half years. People came up with ideas and solutions to questions I raised. Those who listened to my show and have followed it have the walked the talk. I can say that for sure. Enough of looking at the world through pink glasses all the time. I am a die hard optimist. But please don't tell me that I don't have the right to talk about something that affects me. I am as normal as you are and if I get angry or pissed once in a while I don't see why I cannot be. Even in retrospect when I think an outburst was a mistake,then so shall it be. I shall be proud of my mistakes. i appreciate ur logical statements. But at the same time please do keep in mind that bursting out is the first reaction HUMANS usually get.We all are humans and 90% are like that. I am happy that u are one among the rest of 10%. Blogging is not to create any renaisance or make any radical shift of policies. If it occur, (when people like you read and do something)ofcourse Chin gets the pat. 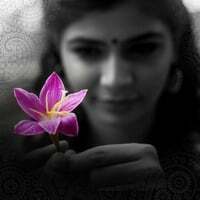 Blog is a digital diary to let out the feelings and write what u feel.Nobody is lamenting on anybody and its just the bad feeling that Chinmayi got to share with her well wishers in this platform. Also i hope she has lot of things to worry that she doesnot want to fetch any credibility by gaining some answer to her feelings. When people understand the problem that itself is a solution to that problem. Even by responding to you here...dont take it otherwise that its an argument. Nobody wants to argue here. Also....everybody doesnot want to go with the things as it is and we are helpless sometimes. Certain people are calling your blog complaint box? The Stanley incident was kind of a shocker to me. Never thought singers would face such hardships. When you give your piece of mind, people have their own views. I know you don't care on pessimistic comments that you are pessimistic! "mom had the wisdom she had for not listening to all the well meaning people"
Hey! I just randomly came across your blog and I can relate to it a LOT. My dad said something that made my day and I still smile when I think about it...'You are not a "girl", and you are not "Indian" during a conversation we had about getting married and continuing to be independent. Do what you want and no one can tell you not to and..
Bharathi: hehe :) That convo sounds interesting. But would like to know a little more there, if you dont mind, as I would like to grasp that one better. Anonynous: What kind of incidents? I have met some of the most wonderful, creative,intelligent and brilliant minds in the industry than outside of it. I Thankfully have met mostly good people so far. The proverbial bad apples will be everywhere but I have not had to work with them or have anything to do with them. And I basically do not comment on how someone should behave/react/lead their lives. Its their option and their life. I am no moral police to write/air my views about someone. Some of my views will be strictly private. I don't find it necessary to air them. Mostly I try to follow the “Is it true? Is it necessary? Is it kind?” rule especially with regard to individuals. You be what you are. That is your inalienable personal liberty. I am very happy to hear that you abide by the rules. You will excel in whatever you choose! Cheers!!! In my opinion, in general, understanding a problem and finding solutions to a problem are two phases (may be overlapping phases) of solving a problem. Subramanian: Your side is more like it. I don't have one by default. :) Shanthamuleni Sowkhyamu ledu. Maaku telusandi. Meeku kooda teliste baauntundi. Walk the talk, Chill out and peace. Hats off, to you, and of course, your mom! Subramaniam: FYI. Its Sahanaa Vavatu. And not Bhavatu. And the precise meaning of the verse from the Upanishad is a tad different. If you have inserted the additional lines in English on your own, then so be it. I agree with you that 'Sahana Vavatu' may be the original. Many people also use Bhavathu. This may be due to the fact that many north Indians pronounce 'Va' as 'Ba' the same way they prounce 'Ra' as 'Da'. Example: Vrundavan - Brindavan, Vishnu - Bishnu, Rabri Devi - Rabdi Devi etc. Many of my Bengali colleagues always used to call my friend 'Vasu' as 'Basu'. I don't want to justify. Will stand corrected. Yes. I took the privelege of extending the meaning between just 'two of us' to 'all of us' with a good intention. The same way the Music directors tweak the original raga to offer a different flavour. எந்த பாடலுக்கும் ம்றுமொழியோ புது விளக்கமோ சுவை கூட்டும் as long as it is mot misused. வாரியார் ஸ்வாமிகள் ‘ஈயார் தேட்டை தீயார் கொள்வர்’ என்பதற்க்கு புது விளக்கம் அளித்தது நற்சுவை. original meaning of the verse was ' கருமியின் பணத்தை திருடர்கள் எடுத்துக்கொள்வர்’ என்பதே. ஆனால் வாரியார் சொன்ன “ ஈயார் - தேனீக்களின், தேட்டை - தேன்கூட்டை, தீயார் - கையில் தீகொண்டுவந்து புகை போடும் தேன் சேகரிப்பவர்கள் கொள்வர் - எடுத்துக் கொள்வர்” என்று சொன்னது புதிய சுவை அல்லவா. I hope you will agree with me that the spirit behind a communication is more important than the exact meaning. It Is. Not may. The scriptures are in Sanskrit. Not in Tamil or Bengali. I agree on the replacement of certain consonants due to Mother tongue influences. Just like most south Indians cannot differentiate between Alp-praan and Maha praan. Also, one thing is that when we are writing a piece as a translation/interpretation it should stick to the source. The translation cannot add new sentences meanings that are not there in the source. Or there is the responsibility of adding our own interpretation only as an addition. However this is not the case in the Swami's viLakkam. Punning and speaking in riddles is something that's an integral part of our culture and way of daily life. People understand the spirit from the spoken word. Not from the written. Every reader has his own way of perception and infusing his own version of an emotion to a text he reads. And as a linguist and as someone who runs a company for interpretation and translation, I cannot agree on your last line. And to also say that I understand what you are saying in your third para: Paththurathan puththiranin miththiranin saththuruvin paththiniyin kaalai udaiththu thei is the same as Tharaiyil thei. P.S: The Raga literally means emotion. There is no hard and fast rule, unless its in a traditional classical music setting that a Music composer must not tweak a raga. And by the way even in strict classical musical settings the 'mishra' aspect comes in wherein the musician is allowed to give in to his freewheeling expression without any bindings whatsoever. And I really wonder if there is a concept called an 'original raga'. The mind is meant to be infinite. And I am in the path of broadening the mind and widening horizons. Not creating roadblocks.